Alone and lost in the Dark of Night during a storm... Our weary traveller explores his surroundings as he tries to find a way past various obstacles. 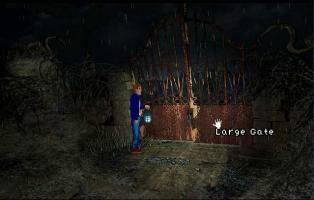 Game is a bit spooky, with a few surprises and some nice special effects as well(lightning, thunder, rain, etc)... Best played with the lights down low, and the sound turned up a bit. ;) Made for the October 2005 "Release Something - Halloween Edition" AGS event. Light and Rain "plugins" are included with the zip download. Game should run fine on most versions of Windows and on most modern computer systems. Hi, I just wanted to say that I enjoyed the demo. I'd love to play this but neither download link works. I loved this game and wish there could be more like it. Looking forward to the sequel. This is a great short adventure game. I really hope it is turned into a full game, that would rock! The atmosphere is easily the best I have seen in a AGS game ever, the lighting and darkness, rain and everything is just spooky and it really draws you in. Wonderful stuff. I hope more scary games of this quality get made with AGS. Hey, that background with the gate in the screenshot. Is that from Alone in the Dark: The new Nightmare? It is isn't it? Cool! I like that game (but it don't work on my computer... even though it's not that old!) It worked on my older computer though. You know I'll give this a try. This is my first post. I loved this game, and I do hope that someday I may be able to walk down the steps towards the sea! After talking to the skeleton several times, leaving and re-entering the bloody stairs room, I still can't find the broken barrel with the mouse. Stylish work. Hurry up with the full version. Really nice game, especially the view (backgrounds, effects). I'm looking forward to a continuation. Good game, and yeah... I think it should be made into a full version. Thanks! Fantastic remake. I usually have a problem with wannabes...but your graphics were great and the puzzles made sense. The ambience was strong enough to qualify this as a great remake. The only problem I had with it was it was too short, leaving a huge plot hole. I just hope that you can extend this into a full length game with a great plot. Please, keep working on it.